It appears BJ Penn may be ending his extended hiatus sooner rather than later, and it seems as though the former UFC champion already has an opponent in mind. Since going dark following his UFC 137 loss to Nick Diaz, Penn took to his verified Twitter account on Thursday to insult the welterweight that arguably beat him like no other man had ever done before. “Look how much bigger you are in this pic,” Penn tweeted accompanied by the above photo. “I thought you were gonna scrap from the beginning homie? What was that coward fence holding strategy to tire out the smaller man? 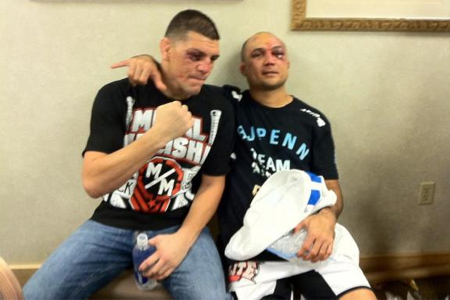 It seemed as though they had buried the hatchet after Diaz hung a convincing unanimous decision victory over Penn in October, but “The Prodigy” clearly still has plenty of resentment towards Mr. 209. Diaz rarely ever hops on Twitter, so it’s highly unlikely he’ll catch wind of Penn’s post for awhile. At the same time, he’s currently got bigger fish to fry with an interim title bout against Carlos Condit just a month away. Is Penn really still this bitter, or is he scheming for a rematch because he believes Diaz will dispose of Condit and this will be Penn’s fastest way back to the top?